Mid February through late May. Mid August through mid November. Work outdoors with a dynamic team to teach life science concepts to small groups of fifth graders and also lead small groups of younger children on tours of the farm and nature preserve. The intern will have the opportunity to work with children of various ages. The program for fifth-graders, called Messages from the Earth, is directed toward teaching life science and includes such topics as photosynthesis, food chains, and interrelationships among organisms. The intern will be one of the guides who leads the students on trails, stopping at various stations to lead them through hands-on activities. The intern will gain valuable experience in a variety of other activities as well, as he or she conducts in-school pre-visit presentations, tends the children’s garden and participates in chores around the farm. It is an exciting and enriching place to be as we work together to open a world new to the students. or call the main office at 740-363-2548. Environmental Education Interns are a key component of accomplishing our Farm and Field Trip program. Interns serve as teaching staff in collaboration with a group of volunteer guides for the 3,000 children (pre-K to High School) visiting our education farm and state nature preserve each year. Interns will teach students about gardening, composting, animal husbandry and ecology while accompanying youngsters on a diversity of farm and nature experiences and activities. The summer interns will serve as Farm Camp Counselors for 9 weeks of Farm Camp for pre-K children with a parent or grandparent, for 6-8 and 9-12 year old children. Housing is available for $190 a month through a partnership with the Methodist Theological School of Central Ohio, just a few minutes from Stratford. Housing includes internet, cable, phone and laundry. Interns also receive free produce and eggs from the farm and discounts on Stratford’s meats. AprilHoy@stratfordecologicalcenter.org or 740-363- 2548, or send a resume, application and letter of intent to Stratford Ecological Center, 3083 Liberty Rd. Delaware, Ohio, 43015. Position dates: Flexible start and end dates from mid-April to late September, 2 positions available for a total of 32 weeks (or 16 weeks for each position). Summary: Assist the Farm Manager in all aspects of production on a 65 acre organically managed farm, including livestock, field crops, horticultural crops and a budding agroforestry program. Stratford Ecological Center is a non-profit educational organic farm and nature preserve in Delaware County, Ohio. The intern will have the opportunity to work with children of various ages, visiting families and volunteers. 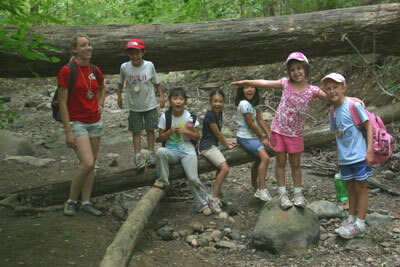 They will be an integral part of Farm Camp, working with camp counselors and the Education Coordinator. Specific farm components include fruits and vegetables, and a menagerie of livestock including sheep, goats, cattle (beef and dairy), hogs, chickens and llamas. Haying is a component of an eight-year crop rotation that includes corn, spelt, oats, sunflowers, buckwheat, barley and two kinds of hay. Additionally, the interns will become involved with fence building and repairs, light carpentry, basis mechanics, equipment operation (small and large), preserve management, and small research projects. For more information, or to apply for this internship, contact Jeff Dickinson, Executive Director/Farm Manager at farmscaper@stratfordecologicalcenter.org or call the main office at 740-363-2548.